A former manager of a Collin County hospice has pleaded guilty to health care fraud, admitting her role in a $60 million scheme that involved drugging patients to “hasten their deaths,” according to court documents, Thursday, June 14, 2018. A former manager of a North Texas hospice has pleaded guilty to health care fraud, admitting her role in a $60 million scheme that involved drugging patients to “hasten their deaths," according to court documents. Jessica Love was the registered nurse case manager and regional director for Novus Health Services from 2012 until 2014. She faces up to ten years in prison and a $250,000 fine. Love is now expected to testify against Novus’ owner, Bradley Harris, and 13 others, including four nurses and five doctors who also were charged in the FBI investigation. 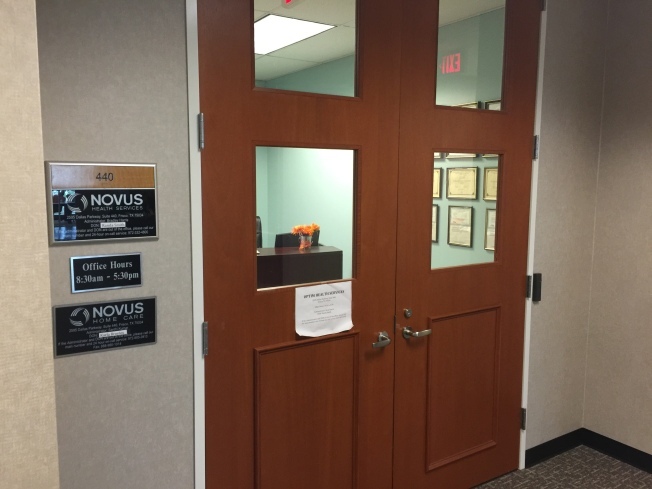 Agents searched Novus' Frisco offices in September 2015. Love said Harris, an accountant with no medical training, gave orders about which drugs patients should receive, how much, and when they should die. Love detailed her role in a court document known as a factual resume. She accused Harris of personally directing patient care. "These directions included Bradley Harris instructing nurses to intentionally over-medicate beneficiaries with medications such as hydromorphone and morphine with the intent to hasten their deaths," Love said. "Harris ordered these increases in medication because he wanted the beneficiaries to die." Medicare and Medicaid pay more for patients who are on 24-hour "continuous care," but according to a complicated formula, hospice owners lose money if patients remain on continuous care too long. Love explained how doctors she recruited participated in the scheme by signing blank prescription forms and falsely claiming they had seen patients face-to-face. Love’s admission included quotes of text messages between her and another nurse who was known to "do it right" when Harris wanted a patient to die. Love admitted her orders to the nurse included "turning off the beneficiary’s oxygen, increasing the Ativan and Morphine, and turning the beneficiary on their left side." Love said in a text message, the technique "works like a little charm," the document said. The patient died within five hours, according to Love’s admission. The court document quoted the nurse texting Love: "Ya know, I was thinking, (patients) are sometimes on (continuous care) for days before I come in. And they almost always pass before my first shift ends. What does that say about me? Lol." Love responded: "That your (sic) a great nurse," adding a symbol for a smiley face. The court document also details how Harris and his wife Amy, who also is charged, kept blank "Do Not Resuscitate," or DNR, forms, so they wouldn’t have to pay for an ambulance if someone called 911. Love is the second defendant in the case to plead guilty. Just last month, former Novus operations director Melanie Murphy admitted her role. The others have pleaded not guilty. A trial in federal court in Dallas is scheduled for January. Love's sentencing date hasn't been set. The FBI search warrant on Novus’ offices said Harris, the owner, once texted a nurse, "You need to make this patient go bye-bye."